The impact of seeing this on this wall in real life is immense. I was humbled to share the experience seeing this for the first time in the company of Patricia and Manuel Oliver whose son Joaquin Oliver was a victim of a mass killing earlier this year in the US. Joaquin was one of 14 high school children and 3 school staff killed along with 17 others wounded when a 19 year old male armed with a semi automatic rifle entered Marjory Stoneman Douglas High School with murderous intent and devastating consequences. Patricia and Manuel have set up a charity Change The Ref “To empower our next generation so they can fight for their values, have their voices heard, and impact change for their future.” Founded in the memory of their son Joaquin who was one of the 17 victims, Manuel and Patricia Oliver are committed to making sure that their son’s life and the lives of the other 16 victims are never forgotten and that real change happens to prevent future tragedies like this from happening ever again. Manual told me that they aim to change the American gun culture by making powerful graphic statements all around the world and urban art is part of their efforts to send their message in non traditional ways. Notice the electrical box cleverly simulating a lecturn inviting visitors to declare their support. Gun control and anti hate are not perfect synonyms but they are facets of the same coin. I felt honoured to be able to show Patricia and Manuel a lot of politically engaged art in Shoreditch including Jimmy C’s Trayvon Martin mural, Bambi’s tribute to Michael Brown and of course the epic new NoHate wall. The #StreetArtAgainstHate originated in Cologne just one month ago and has gone viral. Live and Let Live or #LevveUnLevveLosse in its original German is actually the motto of Cologne, described as a s, 8ArmsToHug says there are now over 530 artists from all over the world taking part, see how many you can identify in the photos! The #NoHate derives its power from its volume, each individual artist makes a small contribution but the mass of messages combine to project a message far louder than the sum of the individual artist’s voices. Street art is a platform which many artists use successfully in transmitting powerful messages to an audience larger and more diverse than their own social circle, and yes, street art supports many campaigns to end advertising, smash capitalism, prevent injustice, stop gentrification, education for all and so on, all brilliant causes passionately cherished by their champions but surely there can’t be a more power purpose that ending hate and ending the insanity of human on human gun violence. My only regret is that I don’t feel capable of capturing the intensity of seeing this wonderful wall in person. This entry was posted in News and tagged ChangeTheRef, Guac, gun control. 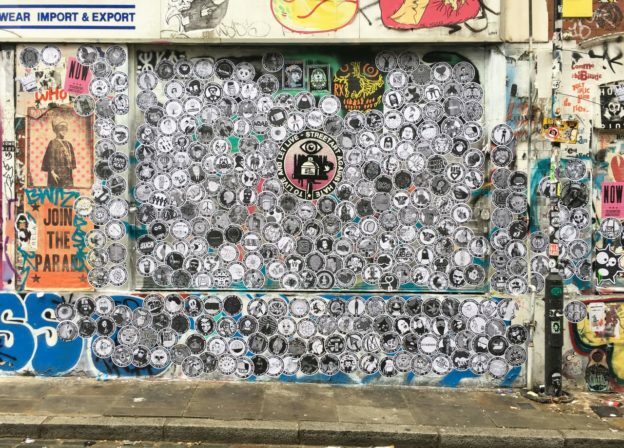 anti hate, Joaquin Oliver, Live And Let Live, London, mural, no hate, nohate, Paste-Up, Shoreditch, Street Art, Streetart, Streetart Against Hate on 11/28/2018 by Shoreditch Street Art Tours.